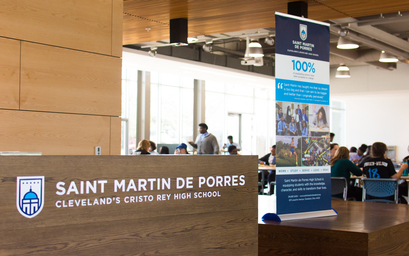 Saint Martin de Porres High School (SMDP) is a Cristo Rey Network school that provides children of modest economic means with an education experience that includes work study, service, leadership training and spirituality. No student is turned down for inability to pay. 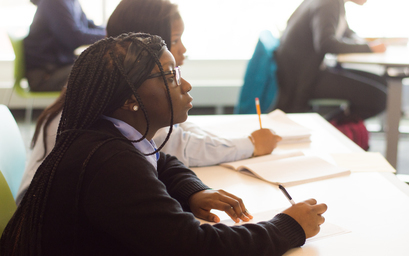 The existing school’s facilities are inadequate to support its enrollment and to maintain long-term success. SMDP has undertaken A Step Along the Way capital campaign to construct a new 65,000 square feet school with flexible space for classroom, meeting and planning space, and a new student center. The $17.9 million first phase, will construct a 43,100 SF wing of the building. The investment will provide quality education and workforce development opportunities to low income children. The new construction is pursuing LEED Silver certification. 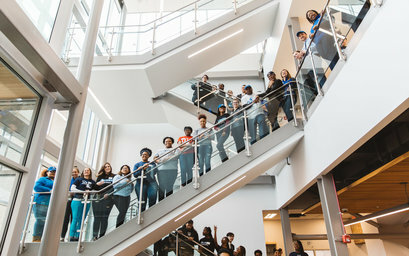 April 27, 2018 St. Martin de Porres High School recently moved into their brand new building at 6202 St. Clair Avenue in the St. Clair-Superior neighborhood of Cleveland. The $21-million project incorporated the old Kausek Brothers Department Store building with the historic copper domes.